“Some days I look at my TL and I’m like why are y’all so pressed!?! 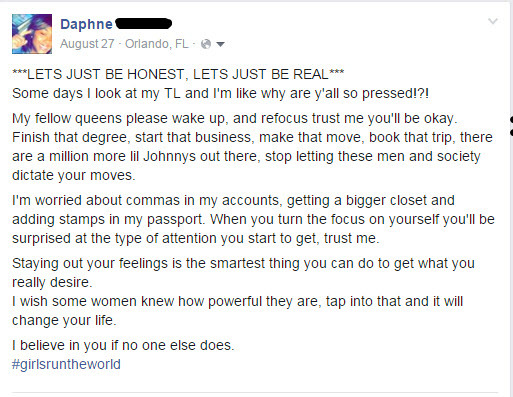 My fellow queens please wake up, and refocus trust me you’ll be okay. Finish that degree, start that business, make that move, book that trip, there are a million more lil Johnnys out there, stop letting these men and society dictate your moves. I’m worried about commas in my accounts, getting a bigger closet and adding stamps in my passport. When you turn the focus on yourself you’ll be surprised at the type of attention you start to get, trust me. Staying out your feelings is the smartest thing you can do to get what you really desire. I wish some women knew how powerful they are, tap into that and it will change your life.